“Are you willing to assist in defending a pilot charged with operating an aircraft while drunk?” the attorney asked shortly into our first call. As a pilot, an instructor and an FAA Designated Pilot Examiner (DPE), this question gave me a little pause. How could I justify defending a pilot who was under the influence of alcohol while “on the job?” That’s where the story needs more detail. We all know that drinking as a pilot is a definite no-no when we are going to be flying. FAR §91.17 indicates that no person may act or attempt to act as a crewmember of a civil aircraft within eight hours after the consumption of any alcoholic beverage or while under the influence of alcohol or while having an alcohol concentration of .04 or greater in the blood stream or breath specimen. This is a rule that has been beaten into us all during training. We know that breaking the rule in any way risks our pilot certificate. But does it risk more? Most certainly, yes. It may risk your entire career. Or it may risk your freedom. A drunk pilot makes the news. The honest truth is that it actually doesn’t happen all that often, but when it does, it is going to make it into a couple of media cycles, especially if it is in a commercially operated aircraft. You aren’t going to hide this. And when it makes media, it makes it hard for prosecutors to ignore. Most states have laws on their books that consider operation or attempt to operate motor vehicles while intoxicated and penalties that come with breaking them. While primarily focused on road-based vehicles, the term motor vehicle does not exclude “aircraft” in most cases, and neither do the penalties. States vary on the severity, sometimes based on the impairment level, anywhere from large fines and jail time on the first offense to minimal penalties in a few states for a first offense. And while these penalties can be applied in the state in which an operation (or, in some cases, attempted operation) takes place, flying is a federally overseen activity. Thus, federal statute also applies. This is where the penalty becomes stiff, and in the case the attorney called me about, under which the charges were filed. U.S. Code: Title 18 - Crimes and Criminal Procedure § 342 indicates that, “Whoever operates or directs the operation of a common carrier while under the influence of alcohol or any controlled substance shall be imprisoned not more than fifteen years or fined under this title, or both.” Oh, and, yes, this is a felony. There is some legal wrangling and definitional details that I am not going to go into the detail of here, but the gist is that if a pilot is convicted of “operating” an aircraft (that is used commercially; think airlines or Part 135 Charter operators as examples) under this statute, they face a criminal, felonious, potentially 15-year conviction. In this particular case, all because the pilot reported to work after drinking. So, back to the attorney’s question, was I willing to assist the attorney in his efforts to defend the pilot? Yup, I was and did. I, and another fellow DPE who also is an instructor for a simulator training company (and familiar with the aircraft type that was to be used for the flight) offered our assistance as aviation industry experts to the best of our abilities in his efforts. We provided reference information on Federal Aviation Regulations, some previous cases we were able to find, information about pilot practices, specific information about the operation of the aircraft that was used, context on commercial operations and crew responsibilities, and as much other information as we were able to find in the research process for the defense of the pilot. We did this not because we don’t think the pilot did anything wrong, but because we didn’t think he was guilty of the criminal conduct of which he was charged. Specifically, that he “operated” the aircraft. In this particular case, the pilot reported for work after his overnight in the hotel, and the PIC for the aircraft suspected a problem on the drive to the airport. The PIC stopped the SIC (the pilot in question) from being able to be a crew member of the flight by contacting his operation’s management and then, upon their direction, contacting local law enforcement to test the SIC for being under the influence of alcohol. The aircraft was not moved, it wasn’t fueled, the chocks were never removed, the engines were not started, and passengers were not loaded. While the PIC awaited the arrival of law enforcement, the SIC did have access to the aircraft, and he did some limited preflight activities that a pilot might normally conduct, but in my opinion at no time do I believe the flight was going to be operated in a commercial carrier operation, the test of the federal charges. That doesn’t mean in a case like this that FAA certificate action isn’t appropriate, nor does it mean they should get off the hook for their FAA certificate even if they escaped criminal charges. Risking a career to alcohol (or other substance abuse) dangers is a serious matter. The FAA is well within its authorizations to revoke certificates, ratings and/or privileges. Under FARs, operation is not required; an “attempt” to operate or act as a crewmember is enough. In this case, the FAA did execute an emergency revocation of the pilot’s medical and pilot certificates. But beyond FAA actions, criminal code may be applicable when the pilot has actually operated an aircraft, bringing with it very real consequences. Attempting to or acting as a crewmember of an aircraft is a serious charge for a pilot, but it isn’t the only related charges that could affect a pilot’s career. 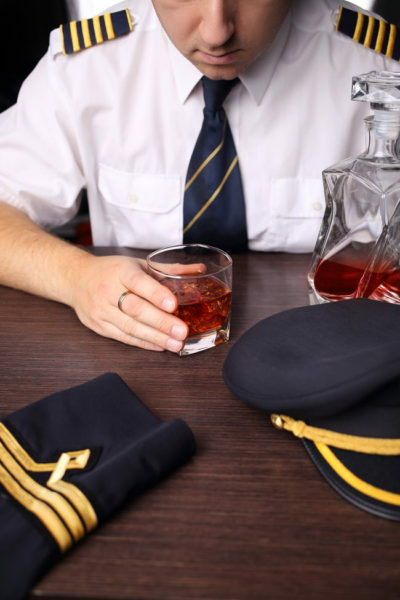 Getting a DUI/DWI or even, and make note of this younger pilots, a minor in possession (MIP) charge can have lasting effects. If convicted, they must be reported to the FAA under FAR §61.15. These can be grounds for revocation of a medical certificate. They can also limit a pilot’s ability to do their job, even if pilot certificate action has not taken place. Did you know that with many alcohol convictions you will be denied entry to Canada? Think that doesn’t matter? Try working for a regional airline that operates between cities in the U.S. and Canada. It can easily be grounds for dismissal from employment or termination of a candidacy for employment. Yup, because you got a DUI/DWI or MIP a few years ago when you were in college. But back to the case. So, what happened to the pilot I referenced above? If you are a pilot reading this and have any alcohol dependency challenges, there is help out there for you. It takes courage, but seek it out. It took courage and hard work to achieve your qualifications; don’t throw them away. Use that same courage to get the help you need. If you know of a pilot who needs this help, don’t turn your back on them, help them. Be the best friend they can have and help them keep their career (or their freedom) before it becomes a matter for the FAA (or law enforcement). I have to think there were other pilots who suspected a potential problem with the pilot in this case, but didn’t step up and help. If you suspect a fellow pilot may be challenged by dealing with such a problem, don’t let it go unaddressed because of not wanting to get involved. Every time we do that, we risk those pilots’ careers and the image of our industry. Substance abuse is a disease that can be treated. If left untreated, it risks the careers and lives of those dependent on individuals’ ability to do their jobs properly. I know it sounds cliché, but drink responsibly out there, fellow pilots, or don’t do it at all. The risk of not doing so is great. Jason Blair is an active single- and multi-engine instructor and FAA Designated Pilot Examiner with 4,900 hours total time and 2,850 hours instruction given. In his role as Examiner, over 900 pilot certificates have been issued. He actively works within the general aviation industry and actively flies volunteer missions. Staying proficient is important, so be sure to visit our Risk archives, where the best instructors in aviation help you fly smarter and safer.